Top ten Twitter apps, but where is Twitter for Android? Twitter CEO Evan Williams has revealed that Twitter now has over 145 million users and nearly 300,000 apps. 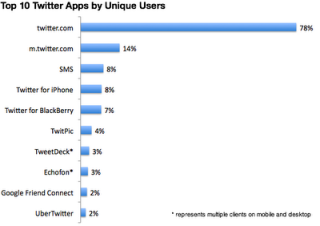 Williams posted on the Twitter blog this week about the state of Twitter on mobile phones, outlining the top ten apps. Interestingly, Twitter for Android does not even make the top ten. However, there are certainly plenty to choose from, with Williams stating that there are nearly 300,000 registered apps in the Twitter ecosystem, a number which has tripled since Twitter's 'Chirp' conference back in April. Williams also outlined a few more interesting facts and figures about the current state of Twitter, revealing that mobile users have increased 62 per cent since mid-April and that 16 per cent of all new users to Twitter now start on mobile. Additionally, he revealed that 46 per cent of active Twitter users use a mobile Twitter app and that 78 per cent of those who interact with Twitter do so through twitter.com, while m.twitter.com is the second most-used Twitter interface at 14 per cent. The Twitter CEO also noted that Twitter's Promoted Products exceeded their expectations, but said nothing about how much money they are currently making. No word on if that means Twitter has turned a profit, but that seems pretty unlikely. Still, revenues are undoubtedly growing.